I wear this scullcap under my helmet. It is thin, it doesn't bulk up and make the helmet fit tight. Although it is designed for warm weather, I find it helps cut a bit of chill on cool days too. It does not go over the ears. For me, it's a good piece to wear from high 50's through low 70's. Since it does retain a small amount of heat, I tend not to wear the cap when it's really hot, although, it is a trade off from a sun burned scalp (as I'm bald). Great cap to keep the sweat off the brow, and give an edge with a slight chill out. I've tried many summer caps over the years and this one is my Favorite as it keeps the sweat off and last longer on your rides. I will continue to buy this cap until something better comes along. The most useful skullcap that keeps my head cool, keeps sweat from my eyes, makes my helmet comfortable-i now own two of them from Western bike works-easy 5 Stars. I use them every ride starting when temps hit 50 degrees, I live in Wisconsin and early season rides start out in the 30's, keeps my hair from ripping out, comfortable one size fits all, no sweat running into my sunglasses, protects bald spot on my head from direct sun. The only thing I don't like is I don't have a couple more of them. Too small for a medium head. I do not understand the good reviews. I have a medium sized head no hair and it doesn't come close to fitting. I have not tried it based on that. I've tried many skullcaps to keep the sweat off my brow and so far this is the best one out there. It fits tight and keep the sweat from dripping on my face as I ride long miles in the sun all summer long. Perfect light weight cap. I wear this even on the hottest days. WENT FOR A RIDE ON A ON A REALLY HOT HUMID DAY AND AFTER AN HOUR THE CAP WAS SOAKED AND SO WERE THE HELMET PADS...NOT SO SURE BUT MAYBE I'D OF BEEN BETTER OFF WITHOUT IT...THINK I'LL KEEP IT FOR COOLER RIDES. PS IT FITS JUST FINE. Summer skull cap works well for me here in florida. Works well here in Florida. When bright sun gets overwhelming I spray water over helmet from water bottle to get long lasting evaporative effects from the skull cap. I love this. I wear these even on the hottwst days. Save helmet and hair. I have multiple that i rotate. This skullcap fits well. I like the design with no tying knot at the back. It makes it more comfortable under the helmet, and looks more streamlined. Works well to wick the sweat from your head and prevent it from dripping in your eyes. Best skull cap I've owned for temperatures above 50 degrees. 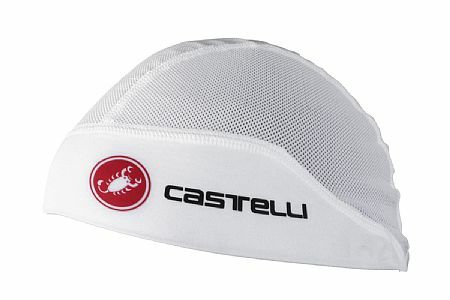 This skull cap does an excellent job of wicking away sweat and keeping it out of your eyes, even on high output rides in humid 95 degree conditions. Airflow through the top is also excellent so no over heating from trapped heat. Its low volume adds virtually no bulk under your helmet and the trim-free design does not leave you with a fossil forehead after your ride. I plan to purchase another one.